Portadown Gets Active celebrates Innovation Award! The Portadown Gets Active Programme extended its reached to over 71 children and 43 peer mentors over Easter in April 2018. 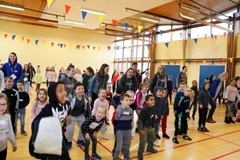 Activities during the programme included physical activities and sport, baking, growing your own edible garden, Go Fly Your Kite and a Talent Show to round off the programme. The edible garden will be revisited in the summer programme to enjoy the fruits of the effort by participants. 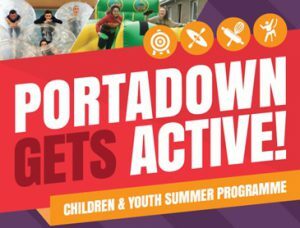 The Portadown Gets Active Programme is a partnership approach to tackling holiday hunger that includes includes physical activity, healthy eating and a continued learning/educational element. Following on from the Summer 2017, Halloween and Christmas Programme, Oasis Youth Project continued to lead the very successful project in partnership with the Craigavon Locality Planning Group to provide a packed programme for children and young people in the Armagh City, Banbridge and Craigavon Borough. A Peer Mentor who supported the delivery of the programme said at the end of the programme that “Every volunteer got to interact with the kids and I’ve gotten so much out of it”. Special Recognition to Our Peer Mentors! 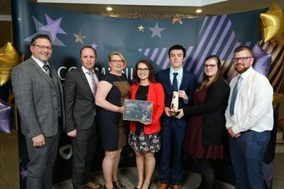 During the Armagh City, Banbridge and Craigavon Borough Council’s Community Awards ceremony on 10 May 2018, the Peer Mentors from Portadown Gets Active won the Innovation Award for their amazing work on the programme. Well done to all the young people who volunteered their time during the programme to support Portadown Gets Active! Children in Northern Ireland ran a summer scheme to support local children in Portadown. 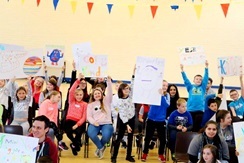 The programme was delivered in partnership with the community and voluntary sector, statutory agencies, local schools and local government with additional support from Craigavon based Almac Group. The scheme Portadown Gets Active was aimed at tackling the problem of holiday hunger. This new and unique initiative was aimed at offering children a fun and active holiday programme, which not only provides a free nutritious breakfast and lunch but also gives children the opportunity to gain an OCN qualification in Healthy Living. – Increased confidence, health and well-being. The Portadown Gets Active project will be running throughout the year during school holiday times summer, Halloween, Christmas and Easter. The project in Portadown is a partnership between Children in Northern Ireland, Oasis Youth Portadown, Children & Young People’s Strategic Partnership, Pathways Activities and Presentation Primary School with additional support from the Public Health Agency, food supplier Brakes UK and the Almac Group. To view the video of the project visit here. The Public Health Agency (PHA) has identified funding for a small grants scheme to address the themes of Mental Health & Emotional Wellbeing, Suicide Prevention and Self-Harm, and have commissioned CLEAR to facilitate this process. The PHA are keen to fund programmes founded on evidence based practice with a particular focus on those using one or more of the ‘Take 5’ Steps to Wellbeing. The PHA are inviting community and voluntary sector organisations, through the CLEAR Project, to apply for non-recurring small grants to address the outlined themes. Award one grants – Up to £1,000 that non-constituted and constituted non-profit taking Community / Voluntary Sector groups can apply for. Award two grants – Between £1,001 and to a maximum of £5,000 for constituted, non-profit taking Community / Voluntary sector groups. If you have a few hours to spare each week and would like to become part of the Home-Start team, they would love to hear from you. Training courses begin in September 2017. The programme will bring together partner agencies including CiNI, CYPSP, Pathway Adventures NI, Oasis Youth Project of Craigavon Intercultural Programme and Niacro. It will give young people, particularly from ethnic minority communities the opportunity to participate in a month of activities during school holidays including physical activity, OCN accredited Health and Hygiene programme, mini medics first aid course and fun cookery sessions that will provide young people them with the skills and confidence to cook small simple meals on a budget. A series of discovery days have been planned for July that will provide young people with a taster session of the programme before signing up the programme to ensure expectation and retention of participants is managed. The programme will run two days per week over the month of August. It is anticipated that 60 young people will complete the programme. Alongside the youth activities, the Portadown Gets Active Programme will work with young people aged 12-16 years through a peer mentor scheme in July followed by a residential opportunity in Ballykinler at the end of the summer. The peer mentors will be empowered with the confidence and skills to support the delivery of the 8-12years youth programme.